Spencer: I’ll admit that, much like Clint Barton, I never took Jessica Drew for the motherly type — she’s always been such a socially awkward, work-oriented character that it just felt like a poor fit to me. Still, Dennis Hopeless and Javier Rodriguez’s first volume of Spider-Woman was so strong that it seemed likely they could sell me on Jessica Drew as a mother, or at least get a good story out of it. Boy, was that an understatement. This first arc of the rebooted Spider-Woman has been astounding, but this week’s issue 5 is especially powerful. Not only do Hopeless and Rodriguez make a convincing argument for “Jessica Drew as a mother,” but they present such a compelling take on parenthood that their editor actually feels it necessary to include a disclaimer on the letters page! That’s some good stuff, there. I’ve seen a lot of eager clamoring on Twitter this week asking about the father of Jess’s baby and her sudden interest in becoming a mother, so let’s start there. Just a reminder (and this applies to all of Retcon Punch’s articles): AFTER THIS POINT THERE WILL BE SPOILERS. The answer is simple enough: After a false alarm, Jess simply realized that she wanted to have a baby, so she made an appointment and got artificially inseminated. I’m sure some day down the line some writer will milk the “unknown father” bit for drama, but for now I hope he remains exactly who he’s initially presented as: a nameless, normal, unimportant presence. As for Jess’s motives, well, that’s an interesting case. The most important word in this scene to me is “decision.” When younger, Jessica made a decision not to have children, then, many years later, she changed her mind and decided to have a child after all. Jessica wasn’t pressured by a partner or society or anything like that: she simply made an informed decision about her life and body. Isn’t that a right women fight for on a daily basis? The decision to have a child isn’t the right one for everybody — something that, again, both the story and the letters column makes explicit — but Jessica certainly has every right to make it, just as she has the right to change her mind about previous decisions. Also significant is that the issue really pushes the challenges of raising a child, perhaps even moreso than the joys. The issue opens with Jess an absolute wreck, something neither Hopeless nor Rodriguez sugarcoat. The content of her monologue is just as important. Just a panel after her “right and good and normal” line, Jess essentially admits that she’s gotten so frustrated with her son that she’s just wanted to shake him once or twice. That’s…pretty dark, honestly, but also an entirely realistic reaction. Parenting is incredibly difficult, postpartum depression is a thing, but those kind of topics are rarely allowed to be discussed, either in real life or in fiction. So again, I greatly appreciate Hopeless and Rodriguez tackling these difficult subjects with such candor. Ultimately, though, the most important lesson this issue has to offer may just be the last one Jessica learns. 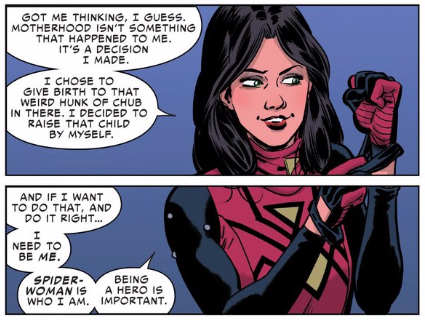 As Jessica points out early in the issue, motherhood has changed her entire life forever, but despite it all, she’s still Jessica Drew, and there’s more to Jessica Drew than just being a mother, even if it is her top priority now. What Jess realizes is that to be the best mother she can be, she has to be true to herself. For Jessica, that means setting a heroic example for her son as Spider-Woman, but other parents no doubt have different interests or goals they’d like to pursue. There are major changes that need to be made when becoming a parent, but that doesn’t mean that your every waking moment should revolve around your child — that’s not healthy either. This is a remarkably balanced view of parenting, and one that gives me faith that, no matter what changes Hopeless and Rodriguez make to Jessica’s life, they’ll continue to respect the core of her character, as they always have in the past. Drew, I really didn’t give myself enough space to gush properly, but I loved this issue — it’s clear this story was a labor of love for Hopeless, and it definitely shines through in the finished product. What’s your take on it? Also, I can’t help but to, once again, be blown away by Rodriguez’s art. Every page is just so detailed, so filled with little quirks and jokes, and then there’s those sequences that just change everything up, like Jessica’s wordless, faceless night out or the scene with Ben Urich that keeps its participants off-panel nearly the entire time. Did you have any thoughts on those moments? Were there any other scenes that stood out to you? Also, do you think this baby is ever gonna get a name?! 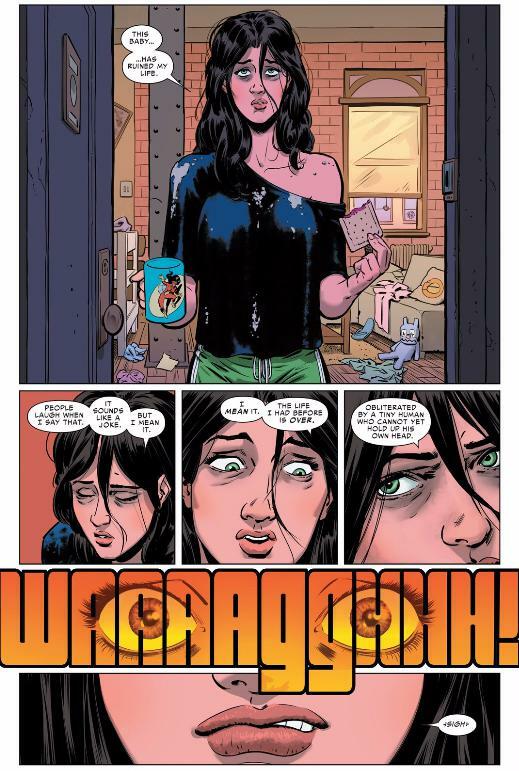 Drew: You know, it hadn’t occurred to me that the baby doesn’t have a name, but I think that speaks to the focus of this story: it’s about Jessica Drew being a parent, not necessarily about her relationship with her son. The baby is treated more like an emotionally charged prop than a character, which may sound a bit dispassionate, but I think it’s accurate to the first few months of parenting. Jessica notes that he can’t hold up his own head, but he also can’t really recognize faces, move his hands with any intention, or really demonstrate any kind of personality. In short, he isn’t a character yet, so I think it’s perfectly logical to focus on Jessica’s story, even if all she’s thinking about is the baby. Man, there’s so much to talk about in this issue. I’m not a parent, but I did spend a few months last year living with my brother and his wife to help out with their new baby. I appreciate that my experience was far different from actually being a parent, but it did afford me front-row seats to watching new parents in action, seeing exactly how they address a lot of the concerns this issue trades in, from anxiety about going back to work (leaving the baby with a bearded uncle-type) to the frustrations when the baby just won’t sleep. It’s with that qualified authority that I am impressed with the honesty and accuracy of this issue. All of which is accomplished in truly remarkable ways. Spencer mentioned a few, and I’m hoping I can address them all in turn. First, I have to start with Jessica’s breathless monologue from the opening of the issue (compiled here from two non-facing pages). That’s a lot of text, but don’t bother if you can’t read it all at this size — the point isn’t really in the specifics of what she says. First, notice the way Rodriguez plays with time and space here. 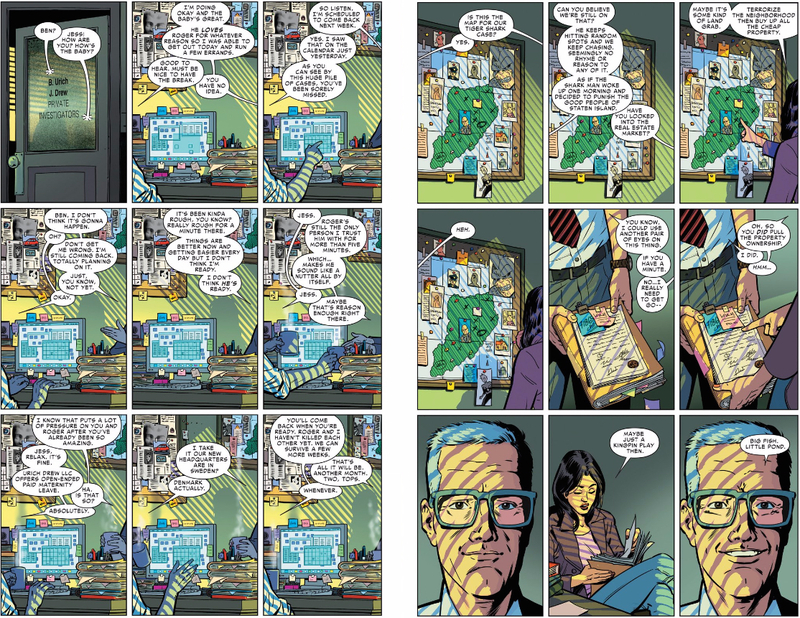 The space is continuous between these panels (at least, within each page), and the sequence follows Jessica as she moves through it. It’s a familiar effect, but Rodriguez twists it a bit here. We might expect an artist to treat each panel as a moment in time, such that Jessica only exists within each moment (therefore not spilling accross panels as she does in every single instance here), or we might expect an artist to eschew panel borders entirely, giving us one page-sized image filled with multiple Jessicas. Instead, Rodriguez combines the two approaches, capturing both the passing of time and the chaos of Jessica’s movements as she moves through the space. But of course, that’s not all this sequence is doing. It reads here like a monologue given to the audience to catch us up on her life — a convention of fiction we accept, in spite of its weirdness. It’s only at the end of this scene that Hopeless reminds us that Jessica is talking to characters within the diegesis of the scene, making her three-page brain-dump feel all the more remarkable — this isn’t a character speaking for our benefit, this is a person who’s under stress and has been cooped up with nobody to talk to for just a little too long. We’ve all had those “I’ve said to much” moments, but Hopeless manages to squeeze a belly laugh out of that realization by playing into a narrative convention we take for granted until too late. Okay, I could probably talk about that sequence all day, but I want to touch on the other moments Spencer mentioned. Up first is that wordless “going out” scene. I’m maybe a sucker for this kind of visual storytelling, but I think Hopeless and Rodriguez have a very specific reason to reduce everyone’s dialogue down to simple icons: Jessica isn’t really listening. She hears enough to know that their priorities aren’t her baby, but she has too much on her mind to really care about what they’re saying beyond that. I’m going to leave it at that for now, but I’m curious to hear people’s thoughts on the way those icons characterize their speakers — Carol and Jennifer never repeat themselves, while Clint and Patsy are almost single-minded in their comments. Does this say something meaningful about these characters, or am I making too much about a one-off joke? Again, don’t worry about the text — I’m more interested in the framing of each panel. At first, I was a little baffled at Rodriguez’s choice here — he’s so gifted with expression, it seems a waste to plop the camera down in the same place without ever showing us any faces — but once again, the art is reflecting Jessica’s subjectivity. Sure, she’s having a conversation with Ben, but all she’s seeing is the work stacked up on his desk. She’s daunted by the thought of returning, and fixates on the negatives. It’s not until Ben finally manages to intrigue her with a case that she recognizes that human connection again, at which point Rodrigues pulls in for that closeup on Ben. In an issue full of reasons why Jessica might not ever want to return to her day job, this scene manages to give us just enough to believe that she might change her mind. Yeah, this was an incredible issue. It’s a big ol’ cliche to point out that having a baby changes everything, but it’s quite another to detail the hows and whys of that phenomenon. This is a creative team that can capture all of those reasons with such subtlety and grace to truly put us in Jessica’s shoes. It’s a decidedly unusual realm for superhero comics, but with Hopless and Rodriguez at the helm, it feels perfectly natural. What really makes this avoid the trap is the surrounding context. Firstly, this is a superhero comic. This sort of story is new for superheroines. This isn’t limiting women to one role, but creating new ground for women in the superhero genre. Secondly, Jessica is surrounded by women who don’t have children, express no interest in having children and, because of our understanding of how the genre goes, are highly unlikely to ever have children. Jessica being a mother doesn’t invalidate Carol’s life choices, or She-Hulk’s or Patsy’s. It happily accepts that there are many ways of being a woman even as it chooses one specific path for Jessica. That is important. I wished that Peter Parker was the father. A comic about pregnant spider-girl #1 (of 3) was an even dumber idea than that comic about the hipster dork with a bow. Somehow both ended up great comics and this one has to be on anyone’s first quarter list of comic of the year. Marvel, you’re welcome for me taking a chance on such a stupid idea. Admittedly, I had to read through some legitimate low grade comics to get here, but holy cow does this deliver all over the freakin’ place. I could probably gush for pages just about the writing of this comic, but that would do a disservice to the art team who has put together a must read seminar on how your art choices drive the story in the comics medium.